The powerful, 160-piece CFCArts Symphony Orchestra and the scintillating CFCArts Big Band invite you to experience Jazz, Joel, and John. 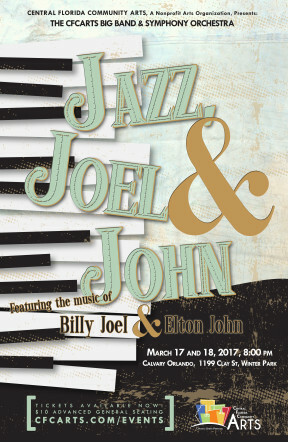 Featuring an exciting combination of some of the best jazz standards and stunning orchestral arrangements of the music of Billy Joel and Elton John, these two dynamic ensembles present a high-energy concert that will have you dancing and singing along! Don’t miss this chance to experience your favorite songs from two of the most prolific songwriters of all time as you’ve never heard them before! Jazz, Joel, and John will be held Friday March 17th and Saturday March 18th at 8:00pm at Calvary Assembly, 1199 Clay Street, Winter Park, FL 32789. All seats in the auditorium will be general admission. Tickets are $10.00 each for Advance General seating and children 12 and under are free. Tickets will be available for purchase at the door for $15.00. Ticketing problems or questions? Contact the CFCArts Box Office: (407) 937-1800 ext. 710 or boxoffice@cfcommunityarts.com.